I'm not sure what this is going to be, but I think it will be a list of the meanderings of my mind (scary thought!). Hopefully some of my epiphanies will prove interesting or provoke some thought and hopefully the occasional chuckle. This winter I've been busy renovating. I started on the living room but while waiting for the hardwood floors to dry I got started on the bathroom. Here's a photo journal of the experience. Photo - this is the BEFORE pink bathroom. The original sink, tub and toilet were pinkish like the tile. We replaced about 10 years ago with white. Now it's past time for that pink tile colour to go. There were also some other problems. No fan in the room and so the ceiling had moisture spots. The light fixtures were original and so they will be replaced. The vanity has a faux pinkish laminate. This was popular in the 1960's because my childhood dresser had the same pinkish laminate. After removing the shower curtain and everything else from the room I scraped the ceiling of the loose and peeling paint. After scraping for a while I ended up duct taping a scraper to a painting pole. This allowed me to give my knees a break from climbing up and down the ladder. I could easily scrape while standing on the floor. Prior to painting the tile I took a rough sandpaper and sanded both the tiles and the laminate to rough it up a bit. I used CIL Smart Anywhere white primer as a base coat for the tile and the laminate. There was even enough of the primer left over to do two coats on the ceiling. When that was dry I did two more coats on the ceiling with the Behr white satin finish - the same one I used on the tiles and trim. I used is Behr water-based acrylic paints with primer in the paint. I debated a lot about whether to remove the tiles. I considered the time and effort to repair the wall to get it smooth or replace with something else like bead board. I realized the easiest and most straightforward fix was to just paint the tile. The vanity. trim and baseboards were painted with the white satin paint. The drawer pulls were bronze. I painted over the drawer pulls in white as a lazy and cheap fix. I did three coats of white on the tiles. (The bathroom is small so there was no shortage of paint for extra coats). The CIL Smart Any Where primer used on the laminate has a strong "profile" so it grips well with the next layers of paint that are laid down. 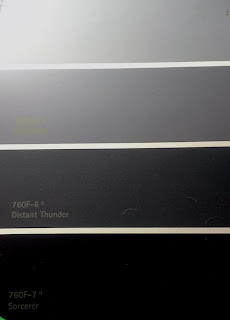 My colour scheme for the new bathroom is by Behr as well, again with primer in with the paint. 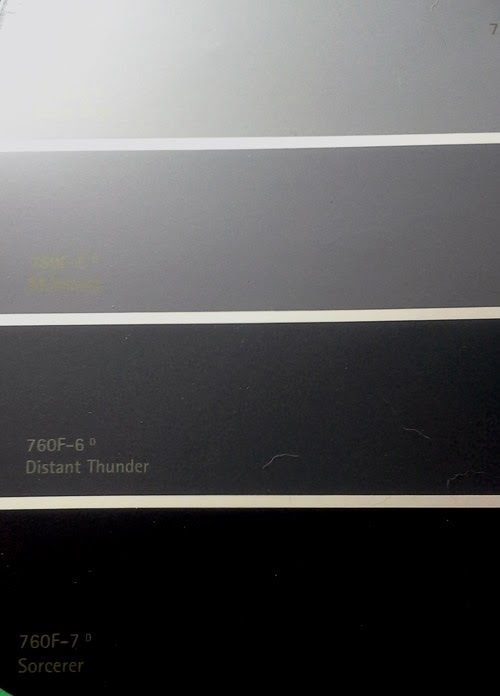 For the walls above the tile I painted in a dark gray Behr 760F-6 Distant Thunder. I wanted a dark and dramatic look. I debated a lot about dark on the bottom or the top and finally decided on a non-traditional dark top and light bottom. I did two coats of the gray. I am super pleased with the result. I also did a faux marble on the laminate. I used all the colours on one colour card (listed below) and then added in a soft white. I bought the tester size of the colours. There was plenty to finish the entire job. It was recommended for the faux laminate that I use the flat paint with primer in the paint. Flat was selected since it has more of a profile to grip with the sealer which would go on top. After doing the faux marble I did three coats of a water based non-yellowing sealer. The sealer was not smelly and each coat was completely dry in three hours. Two wooden storage boxes bought years ago at Ikea were painted white and the drawer fronts painted gray. They are resting on the toilet. I already had many white accessories and some could easily be painted white or gray. A small plastic stool I painted dark gray. Wicker containers I painted white. When doing the faux marble I used a rag for each colour. I would dip the rag into the paint container and then tap it onto the laminate. I focused on doing streams of white that branch out in the marble. The mirror I hung on the door, from Pier1, was originally bronze and I painted it white and then gave it three coats of Martha Stewart Silver paint. The curtains are not bathroom curtains but they were so perfect I got them. Habitat "Rebecca" panels from Home Depot. The white shower curtain is a mould resistant fabric. I needed two shower curtain rods and hung them side-by-side. I've always put knick-knacks on the windowsill in the bathroom and most of these I already had in the home. The lanterns are from Pier1. When shopping for lighting I absolutely fell in love with the black chandeliers (I think they're more charcoal coloured) from www.livinglighting.com here in London Ontario. I learned how to install lighting on U-Tube, along with a few questions at the store. I did them myself. First time to install an electrical appliance. It was scary but I got a great feeling of accomplishment by doing it myself. Other accessories like the bamboo star and wire container were gold and I painted them white. I also made a shelf painted gray to go over the door. It will hold baskets painted white where I can put extra new shampoo bottles, body soap, etc. This helps to reduce congestion in the small bathroom. I got the shelf idea from my next favourite online program - Pinterest. In fact, the ideas for the bathroom all came from Pinterest. Instead of collecting photos from magazines I created a Bathroom folder on Pinterest and them started to pin every photo of a bathroom or bathroom accessory that I liked. Then I narrowed down my choices as I decided on the colour - gray. I pinned photos of mirrors and chandeliers. I considered wallpaper versus paint, etc. So I must thank all those people out there that took the time to post their favourite bathroom renovations because it helped me with my choices. It also meant that there were no surprises in this renovation. I'd seen every colour and style chosen in photos on Pinterest before trying it myself. Here's a link to my Pinterest photo collection Bathroom - Bathroom - Gray Inspiration. I hope you find it inspiring as I did. I've saved a lot of money doing the renovations myself which left me with cash to buy the lighting and accessories. I didn't realize before how addictive DIY can be. I just love it and I'm planning other projects. Here's a link to my U-Tube videos on how to do the faux marble. 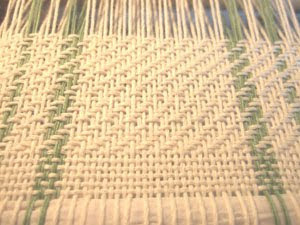 I read in one of my weaving books that you should loosen the tension on the warp when not weaving. So I did. I read that sometimes cats would find the weaving project a nice place for a nap. So I covered it with the weaving shuttles. The cat just shoved them aside. I surmised that the warp wasn't loose enough and that if I make it really loose that the cat would find it too unsteady to sleep on. I had created a beautiful and very comfy hammock. Strawberries & Cream or Pink Fluff? Maybe candy floss would be a more appropriate name to describe this celebration of the colour pink. 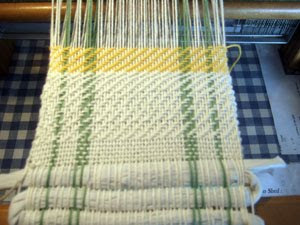 This is my latest weaving project and my second to put on the loom. 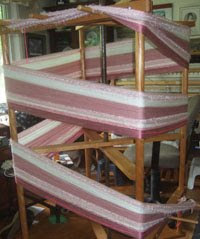 The photo is of the warping mill. It came with the loom (used) that I bought a few months ago. 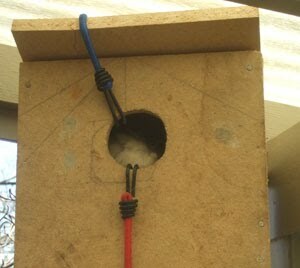 It's a very simple system that helps when making a warp. It keeps all the yarns from getting snarled and helps to measure the length of each strand. Once the yarn is tied on, the mill is turned around and around, something like a windmill, with an easy flick of the hand. My shoulder joints certainly like that idea. The plan is to make 3 shawls one for myself, the others for my mother and sister. 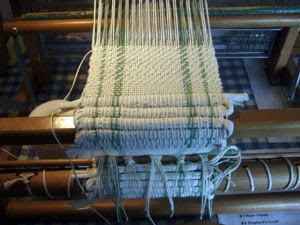 Currently I'm in the process of "dressing" the loom (stringing it) which I'm fitting into the evenings in between various other chores. When I'm not working on it though I have to tuck all the ends in and cover them to keep the cats from playing with this lovely bit of string. This spring has proven to be especially busy with work, hobby beekeeping and gardening. I'm really wishing there were more hours in the day so I could do more. An energy boost wouldn't go astray either! All are doing well, cats and Jeremy squirrel. He's living in his home made house which he really likes. "Weft goes left". At least that's how I remember it. Here's my first official weaving project that is something useful. Just in case you're not sure what it is - it's a scarf. 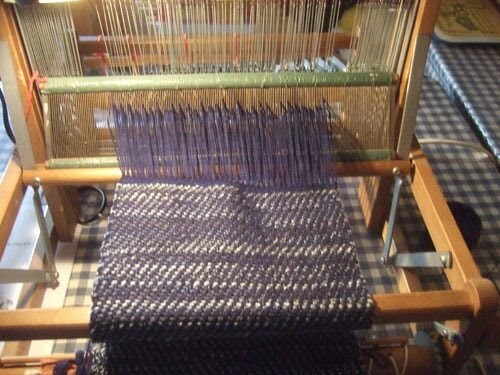 The warp (the strings on the loom at run north and south) is a navy blue wool. 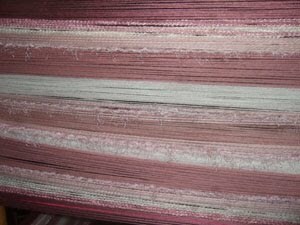 The weft is a denim coloured wool. 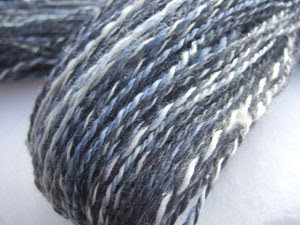 It's roving from Northern Lights that I spun on my spinning wheel. It was interesting to see the fabric's finished look as the yarns were combined to make the cloth. The homespun is a much lighter blue so I can compare to see how much the navy of the warp changed its final appearance. This project took me (a beginner) about 2 days to make. 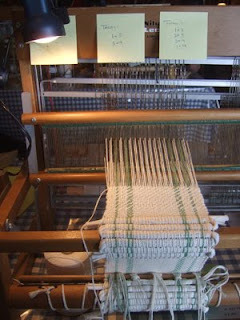 That estimate includes making the warp, dressing the loom (stringing the loom) and then weaving the project. (Photo - the weaving is done and the threads have been cut at the back of the loom, loosening the tension of the warp). The only good part about our weather turning cold and more spring-like is that now I can wear the scarf. I was sitting quietly in the back yard on a warm and sunny afternoon. Spring was blessing us with a few unusual warm days and I've been very much appreciating them. The children who live behind me were all outside and I could hear their laughter while they played. Some of the children must have gone inside and one child remained outside. Suddenly the air was filled with loud singing. This child, I guesstimated to be about 6 or 7, had burst into a spontaneous made-up song. Such unabashed joy and hope were so strongly felt that she couldn't help herself but to express it. I remembered I used to do that too. I particularly remember one afternoon in the barn at Grandpa's that I sang Jim Jimmeny over and over (from the Mary Poppins movie). I sang it while I attempted to balance on the edge of the manger and walk the whole distance of about 8 feet with my arms stuck out sideways. I just loved that song. I asked myself what had happened to me. To us adults. Why can't I suddenly burst out into spontaneous song? (Why do I feel I can't?) I guess I grew up. And I fear 'men in white jackets'. But listening to that little girl I couldn't help but let go a few tears, remembering and regretting growing up maybe a bit too much. Spring has sprung and all the little jobs spring up just like the tulips and crocuses. My honey bees have been busy flying and I've been tending to them - spring feeding and taking their winter hive wraps off. Between getting the taxes done, Red Cross training courses, a really bad cold and some other mundane must do's I managed to take weaving classes... and I purchased a used loom. Her name is Fanny. She's a Leclerc loom made in Quebec and she's now resting, her maple wood polished to a high shine, in my living room. I think the loom was made in the 1970's, but I'll get more details on that later. 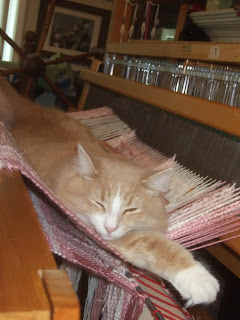 For now, I have a new vobulary, breast beams, beaters, shuttles, heddle hooks, and other parts of the loom. 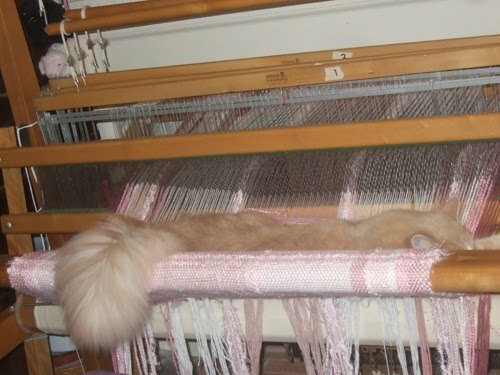 Then there's the different weaves you can make, the plain being a Tabby, the most common a Twill and my favourite so far, the most difficult called Broken Herringbone. For the classes you learn to make four coasters. Thoughts of coasters don't really get me enthused a whole lot but when I realized that the purpose behind the four coasters is to learn the four basic weaving patterns, I realized the method behind the (boring) coasters. We used table looms for the classes and they're really nifty, portable too. The final part of the class is the fun part and that's when you get to really make something. 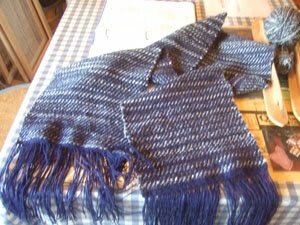 I'm not big on table runners so I opted to make a scarf. Hopefully my loom will be up and running in the next week or so. I plan to make lots of blankets... maybe even some cotton curtains for my garage. 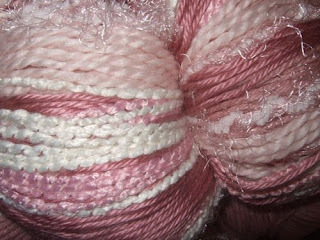 For the scarf I'm making in class, I'm using my own homespun wool. How is your spring going? What projects have you been working on? It took my Dad most of the day to design and make it. 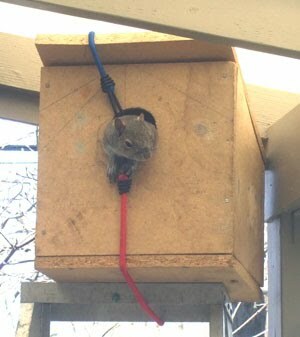 I evicted Jeremy squirrel on a warmer winter day but I knew he'd be intent to get back into the garage. After all, he'd spent considerable time making a home there in the roof joist. He'd carted dried leaves to use as bedding. He snooped through the garage and found plastic shopping bags. These he chewed up to make soft bedding. Then he committed the ultimate crime and stole the curtains over the garage door window. I'm sure he couldn't resist the cotton fabric. 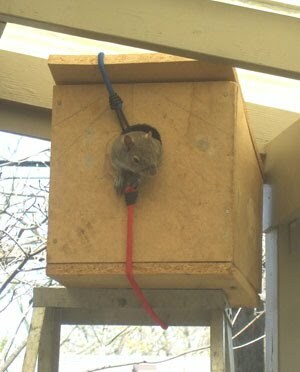 But Jeremy was chewing the wood, probably to make his home bigger and he couldn't be allowed to stay and create damage. So he was nicely evicted. When Dad heard his plight he opted to help. If Jeremy could be happy with a home elsewhere he'd stop trying to get back in the garage. So Dad made him a house. Not just an ordinary house. No, this house is lined in carpet and cut to size. There's enough room for a tubby Jeremy to sleep in a whole bunch of different positions. I set the house up and it took about 2 days for Jeremy to move in. 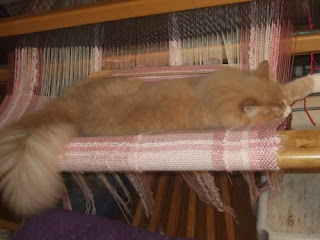 Now he rests in the lap of luxury - scraps of sheep's wool, alpaca fibre, leaves, straw and best of all, the garage curtains. On this sunny afternoon Jeremy was trying to sleep but a talkative neighbour next door kept waking him up. He'd poke his head out and lean out of his doorway to see what was going on. I talked to him to ask him what he was thinking. He sat back down inside his house and pulled the door closed - see the photo where he pushed the sheep's wool up to cover the doorway.